The teams are using electric tools to change wheels with disc brake in just a couple of seconds. One of the last mechanical advances in cycling was to introduce the disc brake on bicycles, an element increasingly widespread among the international peloton. In this constant evolution and in the search for better performance, the disc brake has brought another advance: wheel changes to the style Formula 1. Tal and as shown by images of Cyclingnews, in the present Vuelta a Valencia there are already teams that have put into practice this system to gain time in changing the wheels, something that undoubtedly supposes a great benefit in situations of breakdown due to falls or punctures. In this race, teams like Dimension Data and QuickStep have used small power tools (a kind of drills) to screw and unbolt the wheels as fast as possible, a widespread practice in motorsport and, above all, in the Formula 1. Most of equipment have resorted to this system of change of wheels in the Vuelta a Valencia, but in the past Back to San Juan we could see sets like Bora-Hansgrohe and those mentioned above that already changed wheels with these electric guns. Incorporating this improvement has been fundamental, since as it points Kas Johansson, chief mechanic of Dimension Data, to CyclingNews, changing a disc brake wheel requires more time than conventional brake. 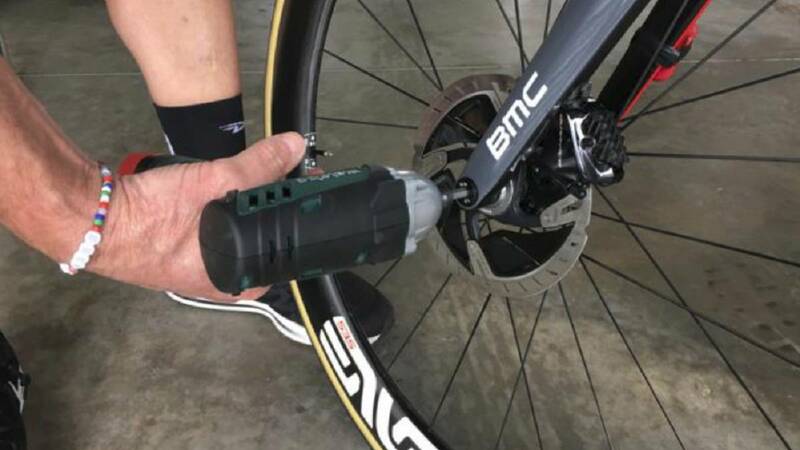 Tal is the effectiveness of this method, Unscrews and tightens the transmission shaft of the wheel in a couple of seconds, that in the last Vuelta a San Juan, Mark Cavendsih suffered a puncture 20 kilometers from the finish line and was able to rejoin the peloton minutes before the end to play the sprint. Johansson made it possible thanks to a change of wheel that has as a mirror the F1. Cycling technology continues to advance.